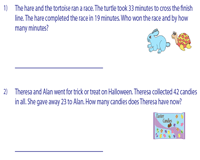 The extensive set of subtraction word problems featured here will require the learner to find the difference between minuends and subtrahends, which includes problems with regrouping and without regrouping. 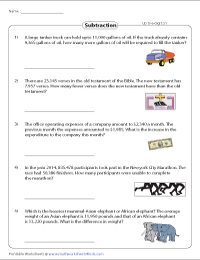 This large collection of word problem worksheets features scenarios that involve single-digit subtraction, two-digit subtraction, three-digit subtraction, and subtraction of large numbers up to six digits. Find the difference between the numbers that ranges from 0 to 10 in the set of worksheets featured here. Use the answer key to verify your responses. 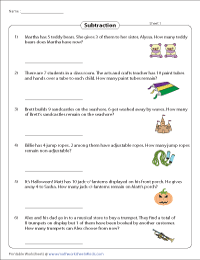 The series of worksheets presented here involve two-digit subtraction word problems that do not require regrouping. Find the differences between the two-digit subtrahends and minuends featured here. The two-digit subtraction word problems presented in the worksheets here require regrouping (borrowing). Determine the difference between the two-digit numbers by following the place value columns correctly. 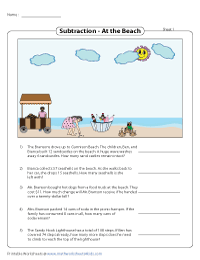 The colorful theme-based worksheets are based on three engaging real-life themes - Beach, Italian Ice and Birthday Party. The set of subtraction word problems featured here will require the student to find the difference between three-digit minuends and two-digit subtrahends. Use the answer keys to verify your responses. Each worksheet contains five word problems finding difference between three-digit numbers. Some problems may require regrouping. This section contains subtraction word problems on finding the difference between four-digit numbers. Both borrowing and no borrowing problems are included. Some problems may involve subtraction across zero. 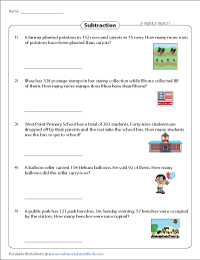 The word problems featured in the worksheets here include large numbers with minuends and subtrahends up to six digits. Determine the difference between the large numbers by following the place value columns correctly.